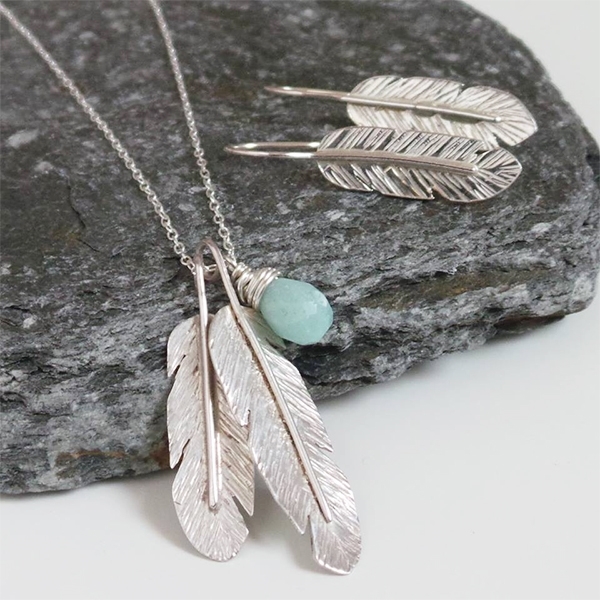 At Kernowcraft, we adore handmade boho inspired jewellery designs. It's all about expressing your creativity and creating something quirky and out of the ordinary that can be worn with confidence. These boho jewellery designs are often seen at festivals and are especially popular in the summer. This is where we can expect big and bold designs, with colours and textures that really stand out. 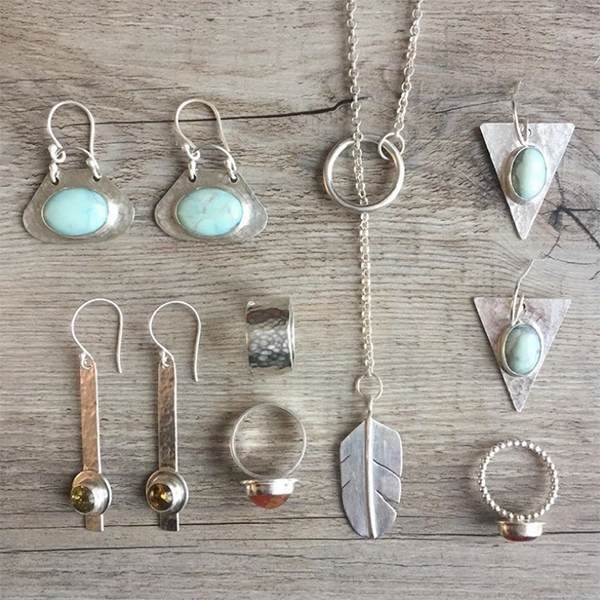 We love seeing statement gemstones used in these boho designs, gemstones such as turquoise, opal, agate and tiger's eye are all popular choices. Today we're sharing with you jewellery designs created by a range of jewellers, all giving us those bohemian vibes that we just love. 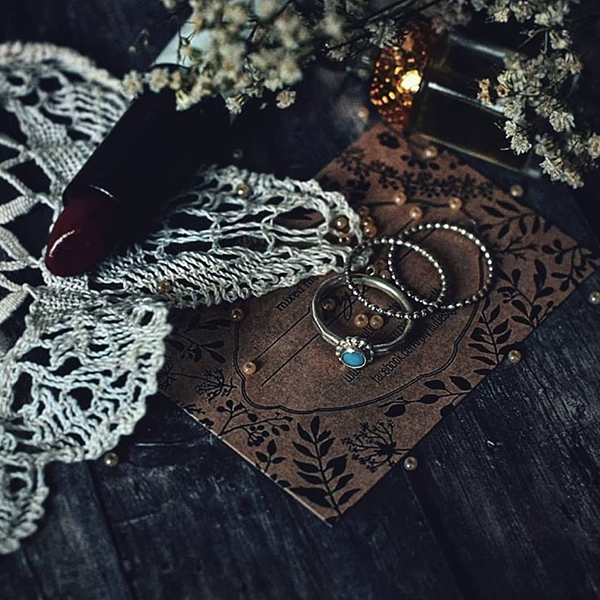 We also give you inspiration and examples of how you can create similar designs using gemstones, threads, charms and more. 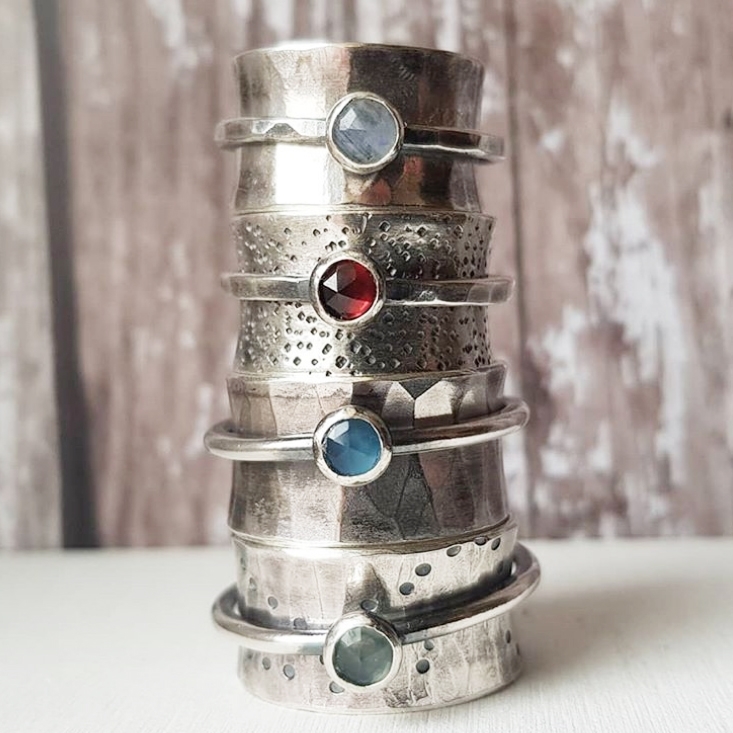 Don't forget to browse our Festival Collection, filled with gemstones and supplies to help you create jewellery for festival season! We love these stacking rings, featuring New Lander turquoise and opal created by Nina Rambelli! 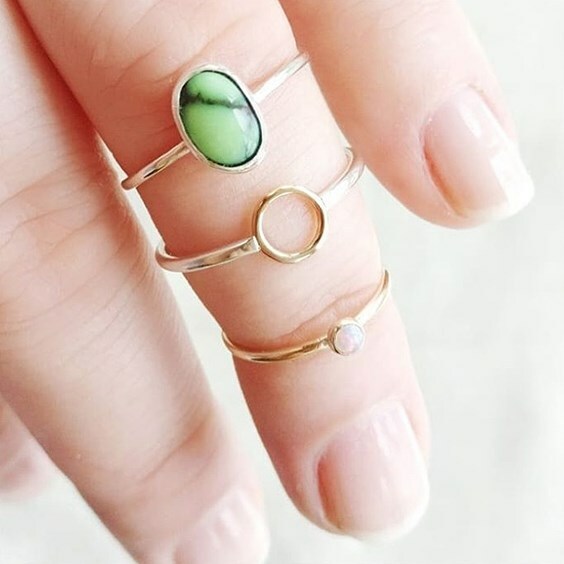 Layering rings, chains and bracelets are a great way to incorporate different gemstones and charms into your design, while also adding textures with the use of cords and threads. Crystals are so fun to experiment with, choose from different colours and shapes to create bold designs. You could create eye-catching earrings, a statement necklace or even create a unique headband. Beautiful leather necklace. Using leather cord and mystic green crystal quartz points. 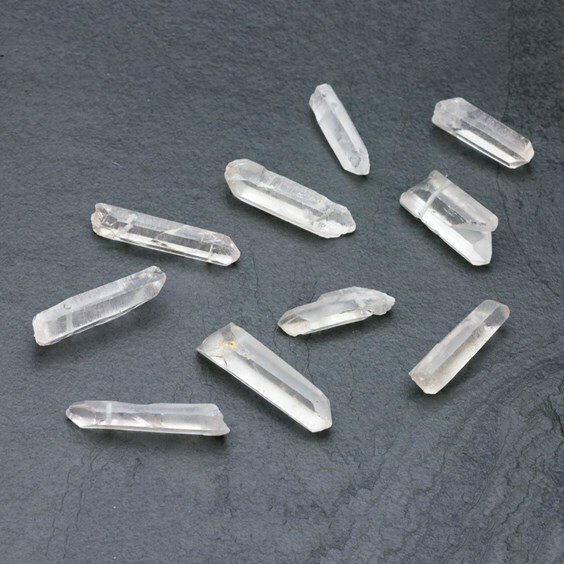 We have a huge range of crystals, from pendants to nuggets for your jewellery designs. Choose from a wide range of colours to suit you, whether you want the summery look with a bright pink or a more natural design with clear quartz. Our crystal points come in different gemstones, styles and shapes, use with any of our threads to complete the look! 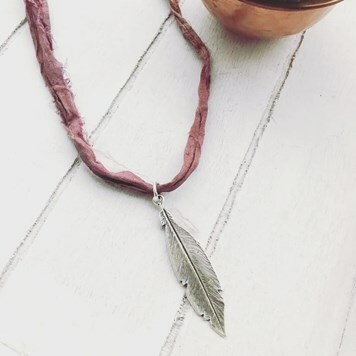 Nothing beats completely natural and rustic treasures that you can transform into beautiful pieces of jewellery. Nature can create pretty amazing things like seashells, sand dollars, geodes to man-made pieces such as sea glass. 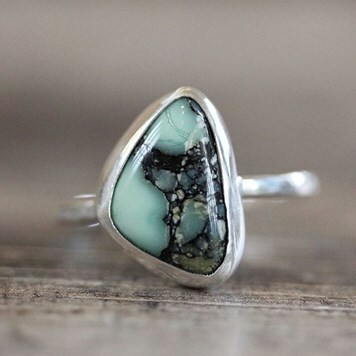 This is also why gemstones are so popular, these natural gemstones connect us with the universe and nature - and how great that we can wear them! 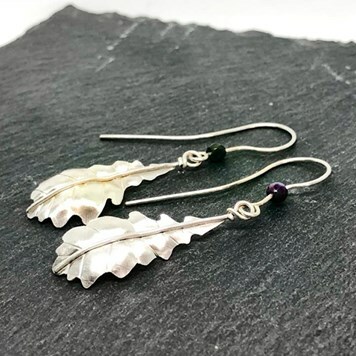 You can also use charms which have natural themes to create simple and easy designs, we have a huge range of sterling silver charms that would be perfect to wear at festivals. Simply hang from earrings or create a necklace! 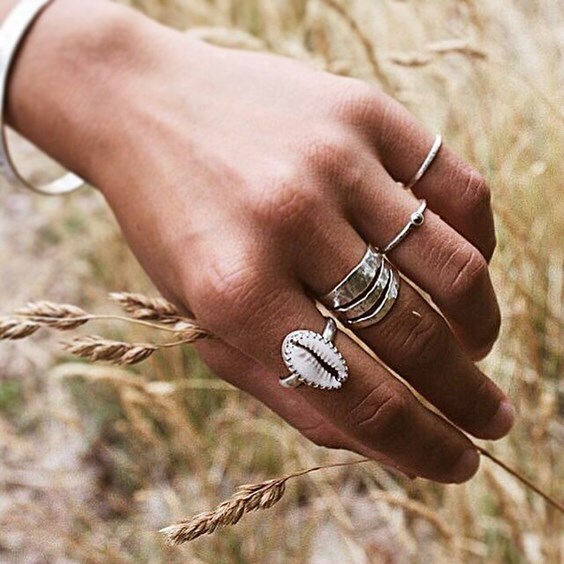 Layering chunky silver and sea shells for a dreamy bohemian vibe. 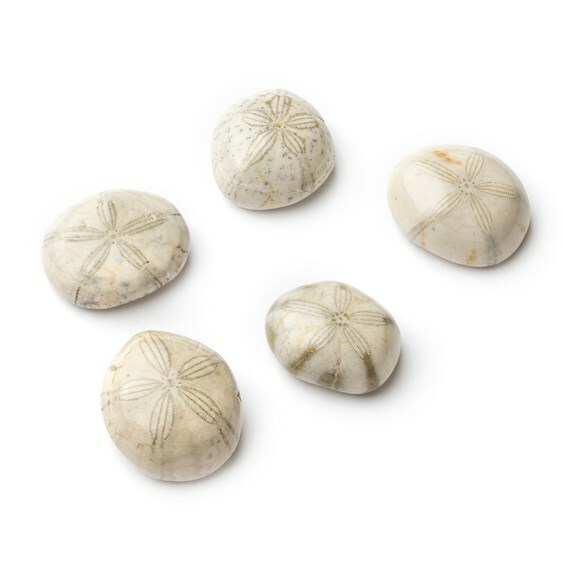 These natural fossilised sand dollars are beautiful! They have a smooth surface and are perfect for creating a ring or pendant. Stories suggest they are lost coins of mermaids, which make them even more magical to us. You could easily create a bezel setting for these to create earrings or a pendant. My oak leaf earrings are perfect festi/boho chic - all handmade from sheet & wire with faceted agate for added sparkle. My Feathers Appear Necklace is definitely a great design for a summer festival. It’s made with Sari Silk Ribbon and some great silver chain which is just out of the photo. The Spanish silver feather charm just finishes it off perfectly. Gemstone briolettes are perfect if you want to add a pop of colour to your designs. 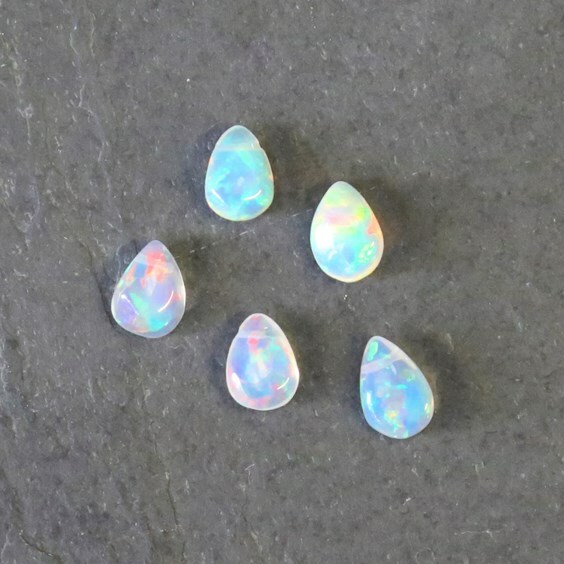 We have a huge range of briolette beads, including these stunning multicoloured Ethiopian opal teardrops. Simply hang onto a thread or necklet and you're ready to go! Head to our jewellery making tutorial page to find briolette projects to try, perfect for beginners. 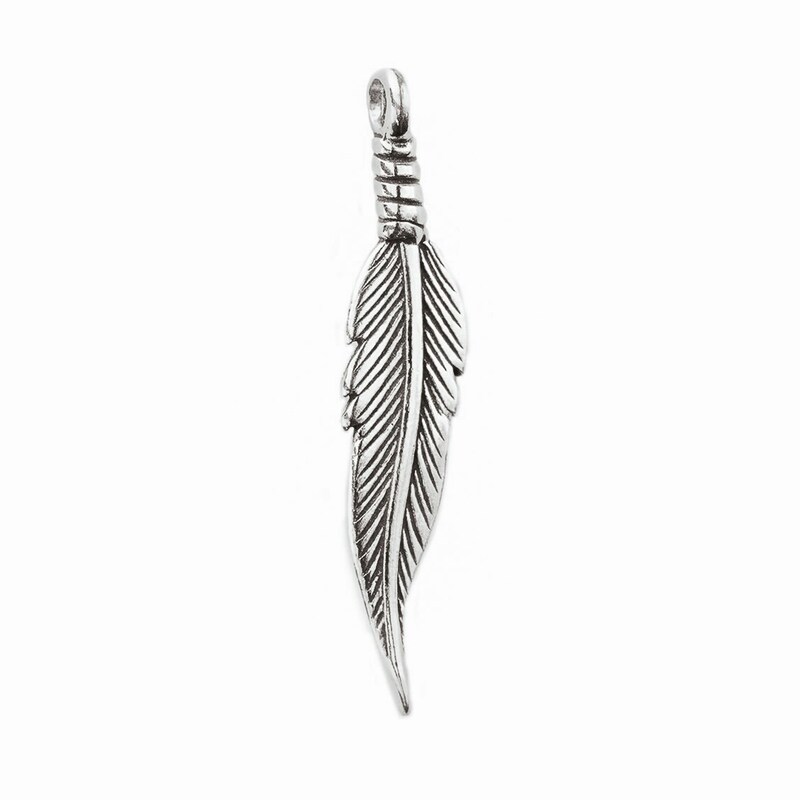 Explore our range of sterling silver and 14ct gold vermeil charms, we have beautiful designs which are perfect for festivals and boho designs. From whale tails, pineapples, hamsa hands, moons to feathers! The great thing about wire-wrapping is that you can experiment with different designs. It could be that you're after something simple and neat, or after a more rustic design. 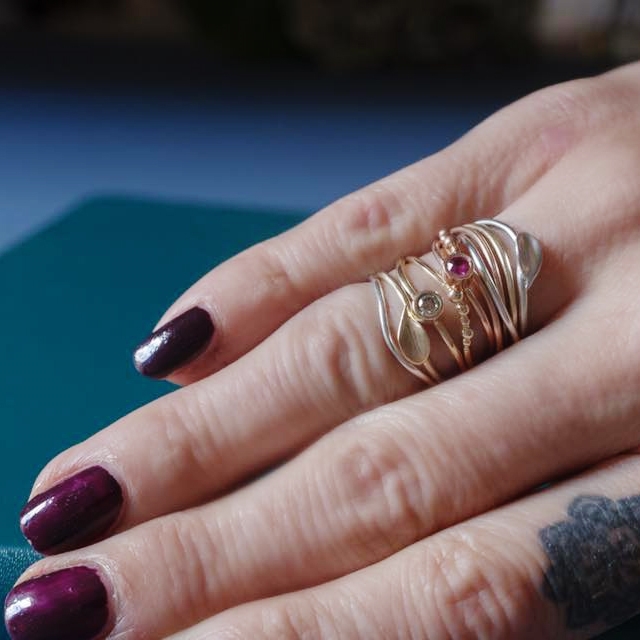 We love Pamela's ring, using copper to create layers, with the main focus of the wire-wrapped amber in the middle. She has also used a torch to create a patina on the copper, revealing the green colour and different shades of copper. 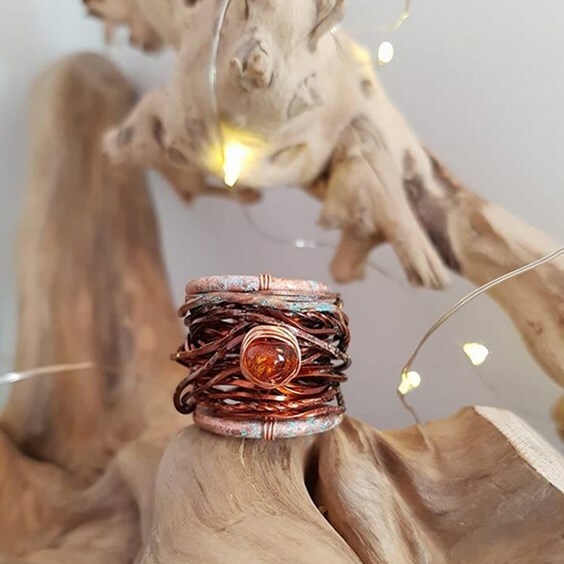 A multi-wrap and twist copper patina and single Baltic amber centre bead to marry all of the beautiful colours of copper together. For the middle wires I used heat (torch) to give it a variation of colour from salmon pink to burnt orange/red; then I soaked the entire ring in nothing but rice wine vinegar and crushed sea salt (for the blue/green patina to take form). It is rather a slower process but very much worth it in the end. I wasn't aiming for anywhere specific or an all over green/blue patina, all I wanted it to do was form naturally as it would a penny on a city sidewalk. Which is where the ring got its name: "City Sidewalks". Moons and stars can always be spotted at festivals. 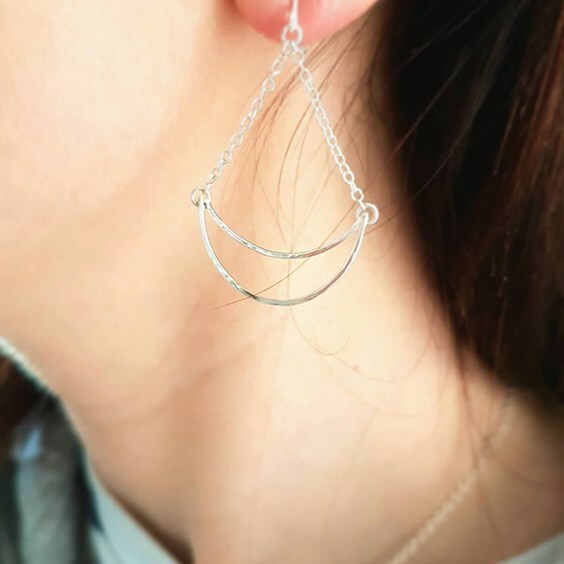 Crescent moons are especially popular and these can be seen as rings, necklaces and earrings - they make us think of the wonders of the universe! Check out our crescent moon charm here - use it to create a simple necklace or hang them on ear wires. 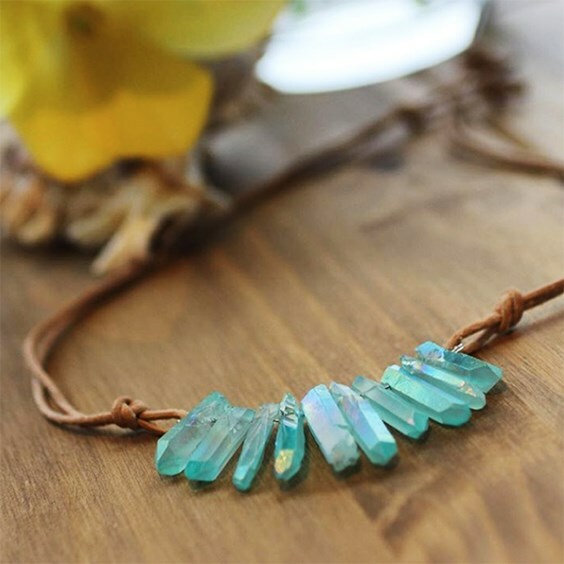 Free form and unique gemstones always make an impact in boho jewellery designs. It's their natural beauty which makes them so popular. You can also use small gemstone cabochons to create stacking rings which also creates a statement design using natural gemstones and different colours. 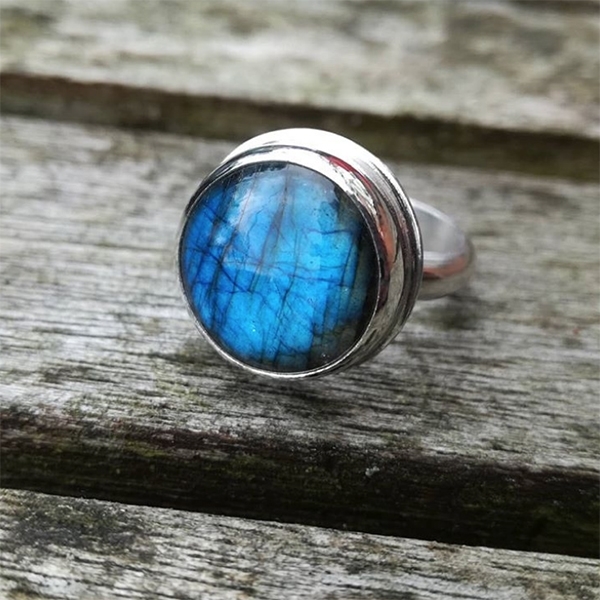 From magical labradorite to mysterious opals, you can find a one-off gem that you can transform into a piece of jewellery. Just finished this Sail Ring with a beautiful New Lander turquoise from Kernowcraft. 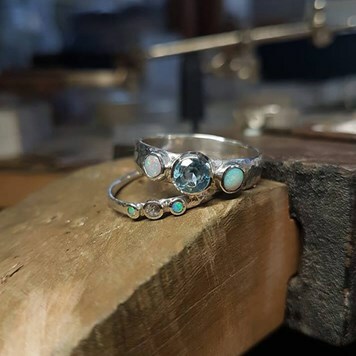 One-off gemstones are always so fun to play with and make gorgeous statement designs. Our wood pipe opals have a beautiful iridescence, they form in tube-like shapes, replacing the inner wood tissue within branches. I think this ring from Ana needs its own pic. Another stunning (labradorite) stone from Kernowcraft. 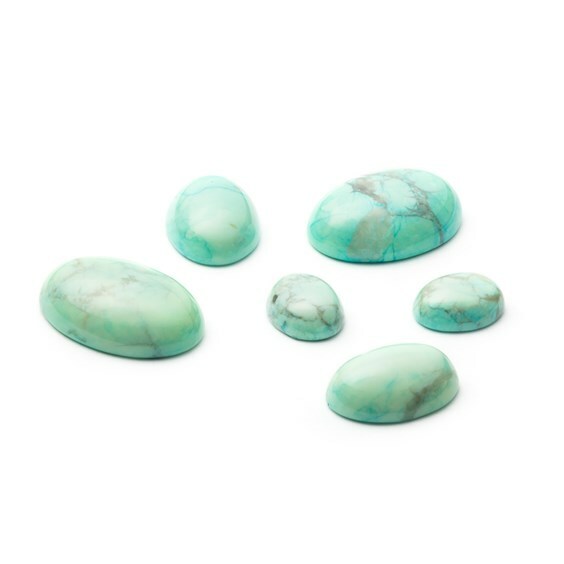 These 'Turquoise' howlite cabochons have been dyed to give them these beautiful soft turquoise tones. They have such lovely unique patterns and markings. This pastel coloured gemstone is great for rings, pendants or earrings - as you can see with Monickka's designs. 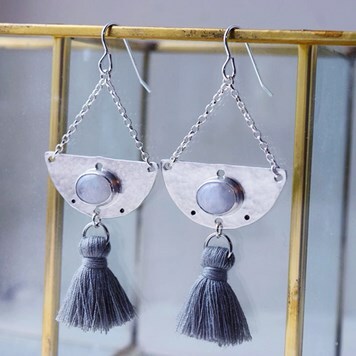 Moonstone Grey tassel earrings - perfect for a boho festival vibe. 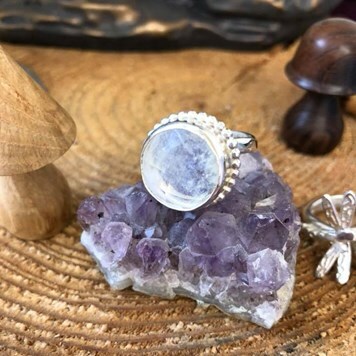 Chunky moonstone ring with a Kernowcraft moonstone. Back home and I set the stones in my spinning rings as soon as I got up. Rainbow Moonstone, African Garnet, Blue Chalcedony and Aqua Chalcedony. 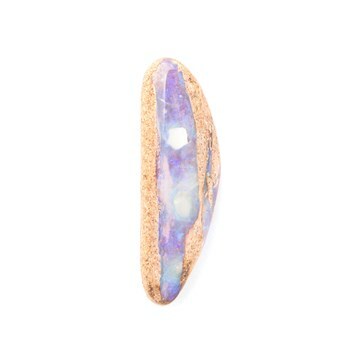 Our moonstone gemstones are so popular! 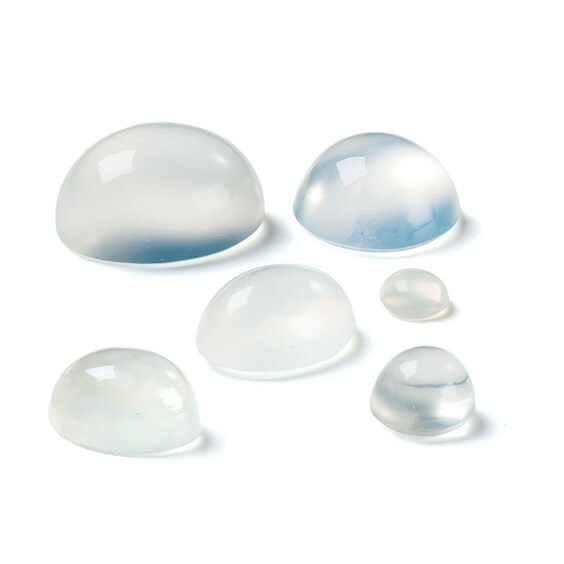 These white moonstone cabochons are a milky, translucent white stone which has a lovely sheen when moved in the light. 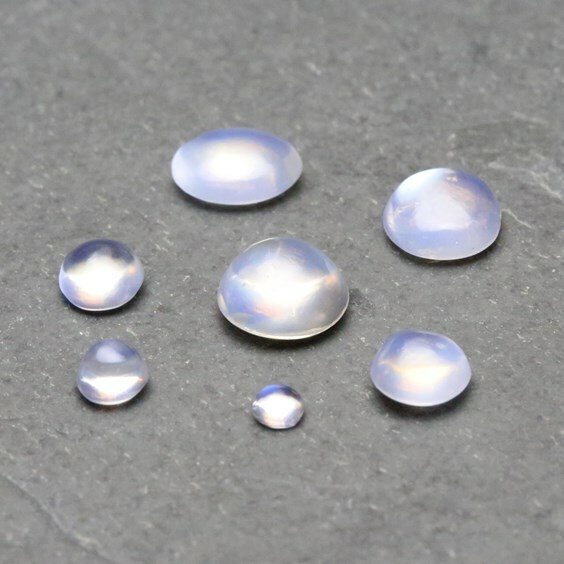 These blue moonstone cabochons almost glow! They have a stunning blue iridescence, which will make your designs stand out from the rest. Layering and stacking is a big thing in festivals and summer looks. Layering chains is very popular, while also using different pendants to add colour and texture. Don't be afraid to mix up your jewellery too like wearing different earrings in each ear - why not have a hoop in one and a stud in the other? It's all about experimenting! Opal and topaz with hammered bands, perfect colourful summer rings. My tiny curvy stack rings look lovely messily worn. 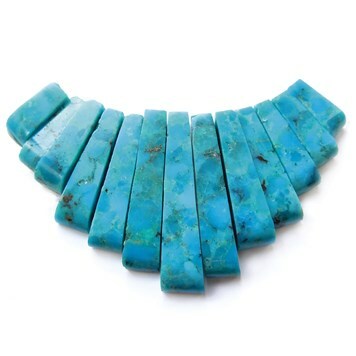 Turquoise is often used with more in bohemian jewellery, with bold statement necklaces, rings and bracelets. Turquoise briolette beads are great to use in dangling earrings or you could go use subtle hints of turquoise in your designs. 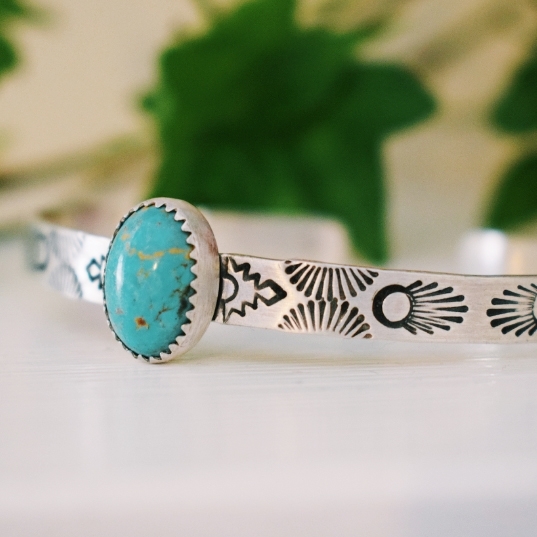 More turquoise newness. The golden veins in this stone are so special I wanted to keep it for myself but then reality hit and I remembered mama's got to pay those bills so I've put it up for sale. If you're after a big and bold look, this tapered gemstone bead set is perfect! Combine with metal beads to add even more detail. 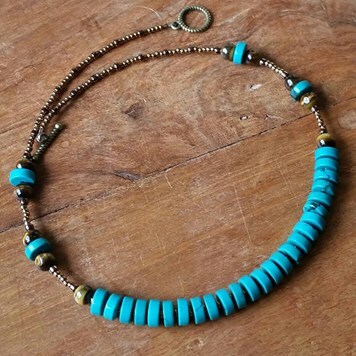 Turquoise, Tiger's Eye and seed bead choker. Don't be afraid to add a splash of colour. Jewellery designs don't have to be simple, you can experiment with different colours and textures! There are so many threads you can use, such as leather thonging, suede cord, hemp cord or simple flex-rite wire. 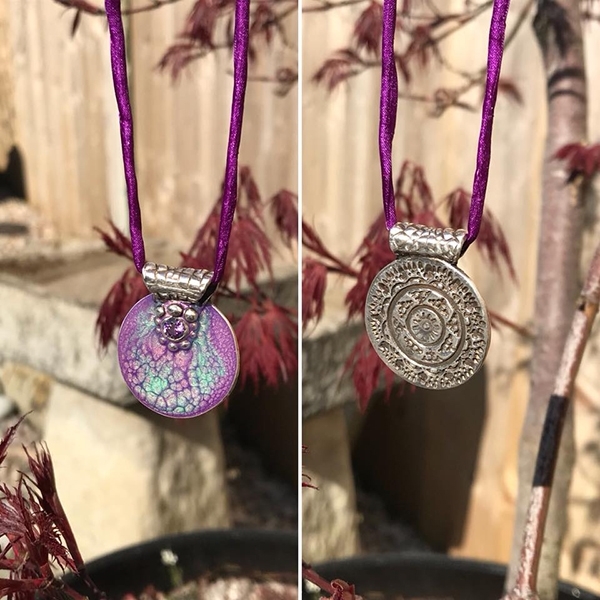 Double sided silver clay Mandala pendant with a handmade silk cord from Kernowcraft. 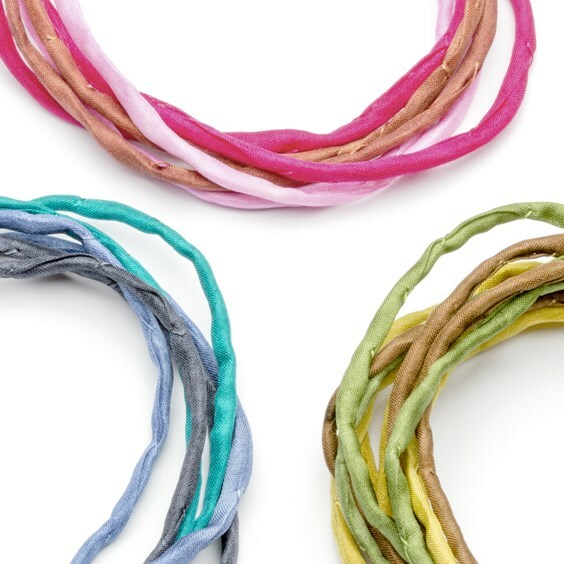 These hand-dyed 100% silk cords are brilliant for summery designs, and they're available in over 10 amazing colours! They're great to use as an alternative to metal chains or leather thonging.